The Access Technology department at LightHouse is here to facilitate the use of accessible technology among people of all ages and levels of expertise, as well as groups and companies seeking education or consulting. We welcome those with changing vision or visual impairment to come explore ways to make their phone, computer or other devices easier and more comfortable to use. We’re here to help you find new technology tools to stay productive at work, or keep in touch with friends and family. Whether you’re just getting started with access technology, or you need to update your skills to keep pace with the latest and greatest tools and apps, LightHouse is here to help. We have a variety of resources to educate and introduce you to different technology, and the ways you can use them. Our staff will take the time to learn about you, your needs and interests and the technologies you may have used in the past. With an instructor, you can explore whether magnification, speech, Braille or a combination of these tools will best suit your needs. You can meet one-on-one with an access technology instructor, and work on skills that will help you achieve your personal and professional goals. We also have group workshops to build skills and connect with the LightHouse community. We invite companies updating their technology, or seeking an accessibility evaluation to make an appointment with the Access Tech department. Contact us about your company’s specific needs, and we can discuss how to help. Design consulting —We can help you plan and design a product that is accessible from the ground up. Functional accessibility review — We utilize our expert access technologists to assess your website or app from an accessibility perspective. User testing sessions — We organize our blind and visually impaired user testers of all backgrounds and levels of vision to provide feedback on your product or service. To sign up for access technology training, contact skuan@lighthouse-sf.org. For design consulting and user testing services, contact elauridsen@lighthouse-sf.org. “Looking through the eyes” of another is a nice empathetic metaphor, but it can quite literally be a valuable exercise. Next month, a mini-conference at LightHouse for the Blind in San Francisco spotlights a new real-time, immersive ocular simulation that allows individuals to experience how people with low vision, color blindness or a variety of eye conditions navigate built environments. LightHouse invites architects, developers, educators, designers and anyone who strives to build accessible environments – including transport systems, urban spaces, buildings, automotive design, interiors, software interfaces and prototyping – to explore a new opportunity in inclusive design: Join us to try on Eyeware. On May 18, we’re inviting designers and planners to move beyond metaphors and look at the world a little differently. For years, vision professionals have simulated various eye conditions through goggles, plastic filters and other low tech solutions. Here, users are invited to try on a more efficient solution. The first demonstration of its kind, Eyeware will demo new virtual and augmented reality technology developed by Theia Immersive Systems that allows designers and consumers to step into a real-time simulation of someone else’s eyesight. LightHouse welcomes Theia in their first North American presentation and workshop at 1155 Market St. (10th Floor) in San Francisco. Co-presented by Yahoo and welcoming a host of other companies dedicated to universal design, this event will take place in two sessions, with one morning presentation geared toward physical space, and an afternoon session focused on interface design. All are invited to a complimentary lunchtime event with two active simulation rooms. The event will likely sell out, so RSVP now. Utilizing a robust set of proprietary visual filters (“like Instagram for your eyeballs”), Theia Immersive Systems’ Eyeware App is the gateway to a software suite that allows design professionals to see the world with a variety of eye conditions including color blindness, glaucoma, diabetic retinopathy and even certain rare conditions that cumulatively affect hundreds of millions of people worldwide. Eyeware can be used with a cardboard or custom headset to deliver a combination VR + AR experience, giving anyone with so-called “normal” vision a new level of insight. The Eyeware filters, when applied, give designers additional tools to audit, manipulate and run wayfinding routes in both preexisting and newly rendered environments. Theia’s design tools can be deployed anywhere in the design process to facilitate collaboration, design review and visual accessibility for professionals, clients and users both sighted and blind – moving designers beyond simple notions of brightness and contrast into nuanced aesthetic palettes that work for all types of vision. The Eyeware App, available now for iOS and Android, sets the stage for a comprehensive design suite from Theia, now in Beta. Why would I want to experience a Visual Impairment? From the subtle, gauzy effects of cataracts to the more dramatic challenges of tunnel vision or retinopathy, changes in vision are incredibly hard to convey in words, photographs or standard-ratio video. Fully sighted designers can guess, but rarely know exactly how to optimize their products for low vision. Developed by the UK Transport Systems Catapult’s spinoff – now called Theia Immersive Systems – to tackle the challenges of public transit, the new virtual and augmented reality software will join the toolkit of accessibility best practices observed by agencies such as the LightHouse and Arch4Blind in communicating the nuances of various eye conditions and their implications for design. With Theia’s tools, the designer now has a direct connection to the experience of a variety of clients and users. 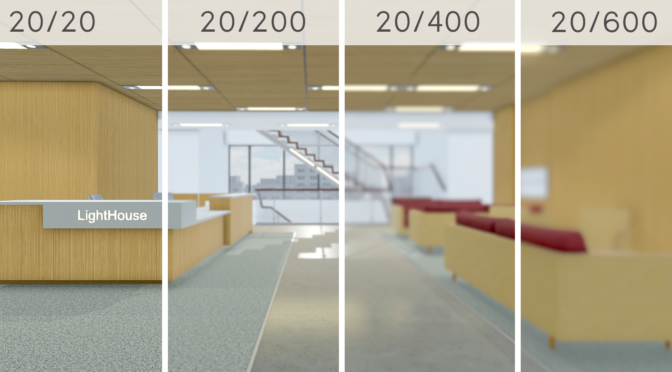 From testing out physical interfaces for low lighting conditions, to evaluating for effective color contrast in side-by-side comparison, to actually strapping on the gear and diving into your CAD model or environment design, these tools give designers an edge on ensuring the project’s visual accessibility from the outset. Join us at the LightHouse to hear Theia’s creators discuss concepts, applications and exciting emerging use cases, including integrations with 3D audio and force-feedback synthetic touch. There will be ample time to try out the technology in custom simulations generated specifically for the LightHouse facility. The Theia and LightHouse teams will also be available for meetings to share more information about product rollout, support and partnerships for maximizing the potential of these exciting new tools. RSVP for the event on Eventbrite. Trouble with Eventbrite? Email dbrown@lighthouse-sf.org. Experience Theia’s ocular simulations over a variety of environments and interfaces in LightHouse’s custom-outfitted simulation rooms. LightHouse for the Blind has teamed up with a special partner to introduce an accessible element into one of San Francisco’s most intriguing new design-focused city art projects: introducing the Market Street Prototyping Festival Tactile Map. Join us October 7th at 5 p.m. to learn to use the map, and then go out and explore Market Street (RSVP to solsen@lighthouse-sf.org). Between Thursday, October 6th and Sunday, October 8th, Market Street will be transformed. Imagine installations all along the wide sidewalks and broad pathways, each with its own engaging purpose – whether it’s to pique your interest, make you laugh, calm you down, or just plain fascinate. That’s the job of the Market Street Prototyping Festival, an annual fair which takes over more than a mile of San Francisco’s iconic main drag each year to give pedestrians something a whole new glimpse into the potential of engaging design. Produced by San Francisco Planning and Yerba Buena Center for the Arts, the sidewalks between 7th Street and the Embarcadero will be filled with temporary installations ranging from performance spaces and relaxation zones to dynamic art pieces and more. Our free map, which covers three festival districts – Central Market, Retail Heart, and Embarcadero – shows, through tactile lines and symbols, all the different attractions of the festival. The maps are made with tactile, braille, high-contrast ink print, and large print text in order to be universally accessible. To get a free copy of our map, email Esmeralda Soto at esoto@lighthouse-sf.org. As part of the weekend, our community services team will also be hosting map orientations and walking explorations of the festival for those 18 years and older. These tours will help blind and low vision individuals get acquainted with our map standards and develop a comfort level with using our maps as an effective wayfinding tool. To sign up to explore the new Market Street art and design installations with the LightHouse, email Serena Olsen at solsen@lighthouse-sf.org. Established in 2015, the Market Street Prototyping Festival (MSPF) is using community-led design to make Market Street more a vibrant and engaging destination for the people that live, work and play along its path. An equal partnership between Yerba Buena Center for the Arts and the San Francisco Planning Department, the Prototyping Festival was born out of their shared desire to make Market Street a more vibrant, connected destination; one that brings together different people, communities, and neighborhoods. This year, over 100 local citizens and organizations submitted ideas for how to improve Market Street’s street life. Thirty of these ideas were selected to become temporary design installations (prototypes), which are breathing newfound joy into Market Street during this three-day festival. After the festival, several prototypes will be further considered for permanent installation under the city’s Better Market Street initiative. This festival is more than public art; it’s a new way of thinking about urban design. These ideas will help shape the future of this legendary street, and set a model for how our city engages the community in the civic process. Join the LightHouse to take in the festival October 6, 7 and 8. Email esoto@lighthouse-sf.org for more info. Imagine wandering the Nevada desert, amid the dust storms, all-night parties, and mind-boggling art of Black Rock City; now imagine doing it on your own and with no eyesight at all. Here at the LightHouse for the Blind, we are more than proud to make that dream entirely possible. Last year, motivated by some of our very own adventurers here at LightHouse, we took it upon ourselves to design something brand new: a Burning Man map for blind people. A year later, we’re proud to announce that we’ve updated and improved the hybrid tactile-visual map for Burning Man 2016, and will make them available not only in Black Rock City, but also here at the LightHouse in downtown San Francisco starting August 22. To get one in advance of the event, email adaptations@lighthouse-sf.org. Calling it “awesome, no matter you level of sight,” The Atlantic’s CityLab aptly pointed out that you don’t have to be blind to use our map. Complete with braille, visual, and tactile representations of the event’s streets, information booths, first aid tents, restrooms, bus stops, camping, parking, and notable attractions such as artwork, Mobility Camp, The Temple and of course, The Man, the map is a great tool for anybody getting to know the festival – and one that is equally accessible to those with no vision. Now that’s inclusivity. After last year’s burn, we caught up with map creator Julie Sadlier, who is part of LightHouse’s MAD Lab (Media and Accessible Design Laboratory). She said the response at Black Rock City was awesome. It’s precisely this type of radical inclusion, we’ve found, that opens unexpected doors and embodies the spirit of the LightHouse for the Blind as well as Burning Man. One member of Julie’s camp last year found himself stuck in a dust storm, taking refuge only to end up sitting at a bar next to a blind man he’d never met before. Without hesitation he pulled out of his pocket a souvenir: a little vile, embossed with braille, a signature of their camp. The man recognized the letters immediately and thus, a connection was made. This year, our map is not only updated with new artwork sites (drawn from a combination of official Burning Man materials and the official unofficial BM Google map), but features a new logo inspired by the 2016-specific theme of “Da Vinci’s Workshop.” We look forward to printing even more than last year, and to hearing your stories when you get back from the playa! To get a copy of our map, call the Adaptations Technology Store (1155 Market St., 10th Floor, San Francisco) at 1-888-400-8933, or email adaptations@lighthouse-sf.org. If you or your organization would like to design a fully accessible, inclusive map of, well – anything – email madlab@lighthouse-sf.org. JOB PURPOSE: The Media and Accessible Design (MAD) Lab is seeking a professional with strong Illustrator skills, someone keen to help us get into fabrication and help us develop the business, spreading the MAD Lab far and wide. By providing individuals who are unable to read conventional print with access to the printed word and visually-conveyed information, the MAD Lab supports the rights of individuals to accessible information. While Braille and audio production remain cornerstones of the operation, our work extends to the creation of tactile graphics, maps, and educational materials. Innovative multi-modal approaches that encompass sense of touch, hearing and new technologies enable people who are blind or low vision and of varying abilities to enjoy full, independent lives. We design with these principles in mind. Talent and technology allow us to deliver quality product at competitive prices on deadline. Tactile maps and graphics – embossed, 3D printed, or otherwise fabricated for optimal legibility. Accessibility Consultation – Typically businesses, government agencies, museums, exhibitors and designers with a focus on making their information and interpretive exhibits accessible. ADA/CBC signage – compliance review and fabrication. Alternative Formats – Braille translation; Audio recording; e-text production (Large Print, accessible .PDF, DAISY). Education or equivalent: B.A. or M.A. in architecture, graphic design, design or related field. Other: This position requires strong organizational skills; flexibility and ability to work independently and collaboratively; capacity to handle multiple projects simultaneously. Strong interpersonal skills to relate to staff, board members, volunteers, blind and visually-impaired clients, and persons in the community with varied backgrounds and viewpoints. Able to sit at a desk and perform computer-intensive work for long periods of time; operate standard office equipment; move 20lbs independently. Learn applicable skills and tools, anticipating advances in the field, and applying new skills to projects. Provide training to colleagues on necessary skills and tools. Train and oversee volunteer’s efforts, as needed. Ensure continuing standards and quality of production of designed materials. Collect and document relevant information to standardize department practices and products. Participate in research and development of new alternative media technologies and tools, building organizational capacity and meeting emergent needs. Collaborate with O&M instructors and other intra-agency partners. Collaborate with partners in related fields on research and design. Develop design standards and best practices for new tools and products. Produce information in Braille and other alternative formats. Work independently to fulfill requests from individuals, non-profits, government organizations and businesses for alternative format projects. Provide quotes / estimates for cost and turn-around time of deliverables. Coordinate all aspects of production, from prototype to completion, including translation, proofing, embossing, collating, labeling, 3D printing, delivery of finished product, customer billing and check requests. Anticipate and meet client needs. Maintain Agency’s HIPAA compliance standards when handling, discussing or producing accessible Personal Health Information (PHI) for clients. LightHouse for the Blind and Visually Impaired is an equal opportunity employer to all. We strive to maintain a scent-free environment and a drug-free workplace. We also operate under a mutual “employment at will” policy. Please submit a cover letter and résumé as Word attachments (no .PDFs please), to hr@lighthouse-sf.org, including the job title in the subject line. If applying to a design position, please provide a link to your design portfolio. We will not consider videos or hyperlinks to online profiles. Due to time constraints we will only respond to complete submissions in which there is serious interest; thanks for your understanding.